Keturah Banning Tomlinson has received the last letter of their late father from their sugar plantation in the West Indies. The news is not good. While still grieving the death of their father, Keturah and her two sisters now face financial ruin. There has been a drought, the crop has failed and the overseer has died just to name some of the things that have gone wrong in the West Indies. The sisters decide to pack up, leave London and travel to the sugar plantation to set things back on course. The idea of three women being heiresses to a fortune and managing it themselves is ludicrous to most men of this time, so most of the men want to marry Keturah to gain control of the plantation, property, etc. However, Keturah has told herself she will never be under a man’s thumb again. The problems facing three aristocratic women when they arrive are daunting. Is there any way they can turn things around for a brighter future? Gray Covington may be the answer, but can Keturah set aside her stubbornness and her fear of a repetition of the past to trust again? Gray is a childhood friend who has also arrived on Nevis to manage his brother’s sugar plantation. He wants to renew his friendship with Keturah as he has kept his distance since her marriage. However, his reputation as something of a lady’s man might harm this. He wants to protect Keturah and her sisters, so he won’t give up his pursuit of friendship or maybe something more? 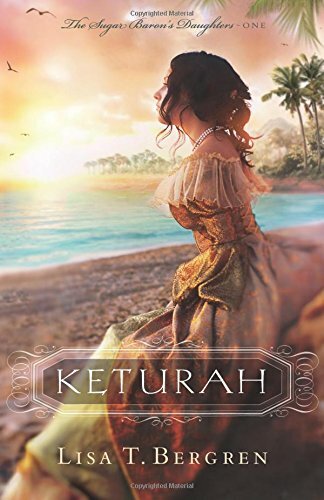 With rich and vivid descriptions of the time and place, I felt like I was in the West Indies with Keturah. The author does an excellent job of putting readers in the story. The slavery scenes in the story, while horrible, I thought were realistic and authentic to the time and place. Her care of her sisters’ future was admirable, thinking of their needs first. My only negative is that the first third to half of the book was a bit slow; it took a while for me to get to know Keturah’s character and get involved in the story. However, with the themes of redemption, forgiveness and God’s ability to love us no matter what made the story worth reading for sure. I also appreciated in the Author’s Note references for victims of abuse. I am curious to read what happens to Keturah’s sisters in the upcoming novels, so stay tuned for further reviews!